Glenmorangie Single Malt Whisky has been distilled since 1843 and is famous around the world. Two years ago, Aquabio installed an anaerobic membrane bioreactor (AnMBR LE™) to treat wastewaters arising from the whisky making process, to reduce chemical oxygen demand (COD) output by up to 95%, as well as creating energy in the form of methane rich biogas. The biogas generated replaces some of the fossil fuels used at the distillery to heat the stills in which the spirit is made. 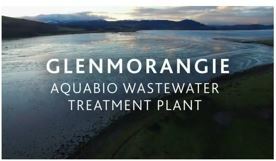 The AnMBR LE™ plant is part of Glenmorangie’s DEEP, Dornoch Environmental Enhancement Project, which was awarded the Hydro Nation Award in 2017 – at the annual VIBES, Scottish Environment Business Awards. In conjunction with our Parent company Freudenberg, a short film has been produced to learn more about the secrets to Glenmorangie scotch whisky and the benefits of the installed AnMBR LE™ plant. This entry was posted in Uncategorised, Water treatment facility, Industry Awards, Company, Anaerobic Digestion, Social Responsibility. Bookmark the permalink.